Check out our two minute video pitch! 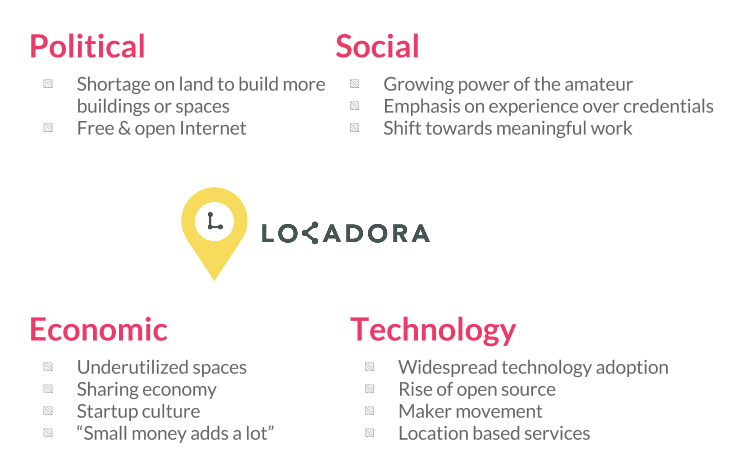 Locadora is a platform both for people with creative interests to find a space to work in and for those who have those kind of spaces to facilitate renting them out. 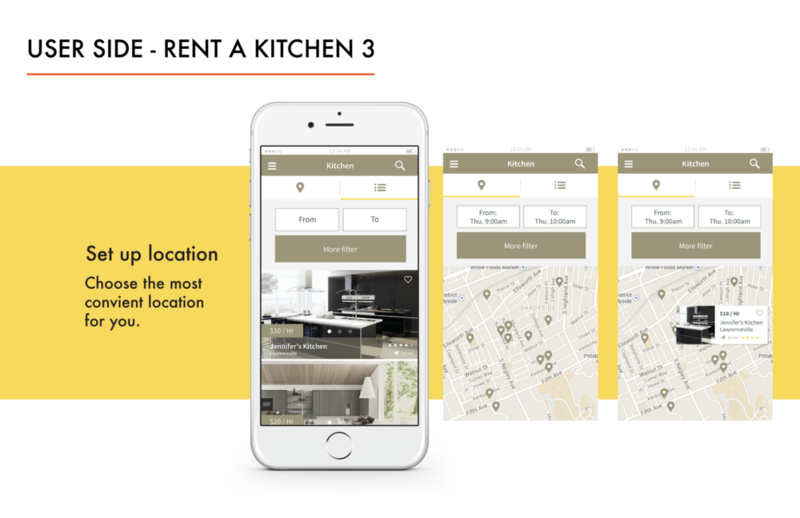 In addition to creating a way to conveniently rent space, Locadora also connects providers with other relevant services, such as cleaning services. For all stakeholders, Locadora creates a unique creative working experience. My contribution Designed surveys, led interview and usability testing sessions, developed business growth model, created storyboards, customer journey maps, prototypes, and a video sketch. Tapping into one part of the passion project life cycle. As a group of creative designer, developer and hobbyists, we originally wanted to build a platform that bringing creative talent together in an open sharing environment. After four weeks of researching and idea pivoting, we finally determined the one particular problem we wanted to solve for those on the journey of creative engagement: helping everyone with creative interests to find the perfect and affordable place in which to work. Why is space important for creativity? How do we prime our brains to take the meandering mental paths necessary for creativity? Recent psychological studies have shown that you can actually increase creativity and productivity by simply optimizing the workspace. An appropriate workspace induces you to capitalize on your cognitive resources and put ideas together. Innovation comes from generating many ideas. As a team, we conducted PEST Analysis and Improv Brainstorming to explore the answer to “How can we exploit mobile technology to create innovative services?” After several round of discussion, we decide on three potential directions for our project: 1) Educate unemployed youth without access to formal education; 2) Facilitate life satisfaction for aging people delaying retirement; 3) Use predictive technologies to enable the power of the amateur. After generating 30 preliminary ideas, we divided the ideas up among the team to search for similar services that already exist. We conducted competitive analysis on their success and shortcomings. If we did’t see a way to beat the existing services, we eliminated the ideas. We then built the business model based on the best combining idea. We conducted three rounds of surveys to gain insights about the dynamics and process of creative cooperation. The first round of surveys focused on partner finding and skill learning. We asked users what kind of passion projects they have besides their professional work and the hurdles they have to overcome. In the second round, we surveyed general opinions on the frequency of use and price range for space renting. We interviewed six participants to get a better understanding of their current process, solutions and difficulties for working on side projects or hobbies. We asked them about their willingness of renting a creative working place and the type of space and supply they need to accomplish the work. Speed dating is a design method for rapidly exploring application concepts and their interactions without requiring any technology implementation. It combines the sketching and lo-fi prototyping techniques; It helps researchers to identify contextual risk factors and to develop meaningful solutions. We conducted three speed dating sessions with potential users and providers. 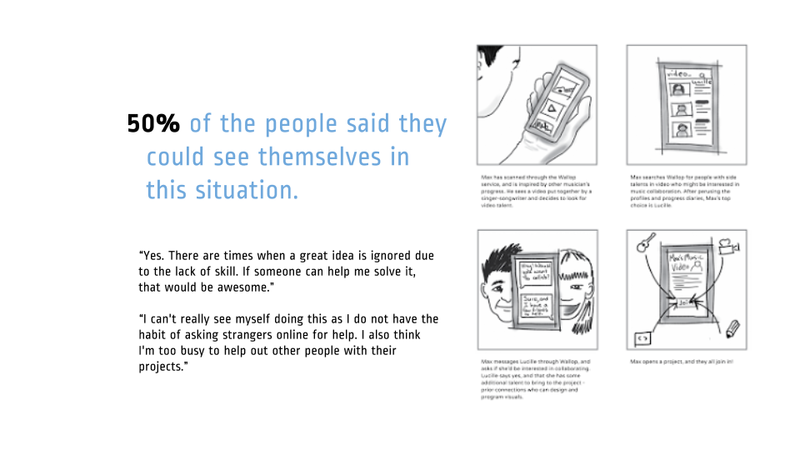 The storyboards were intentionally designed to provoke users to think about how these scenarios might apply to them. 64.3% of the people who are passionate about their creative interests need the right space or supplies or both. Most of these people identify themselves as creative people. Women in the 18-34 and 45-54 age ranges would be most interested in using the service. We advertised Locadora to various maker communities both online and offline. We also used social media to promote our product concept. 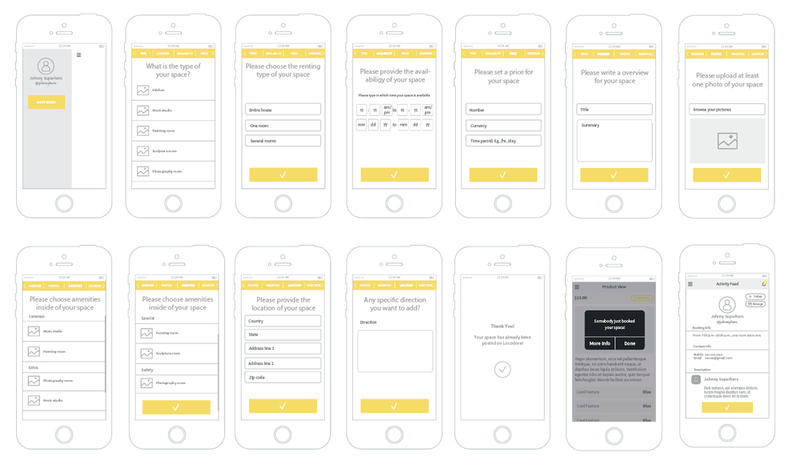 We created four versions of landing pages to test out our taglines and color schemes. We introduced our service in the landing pages and asked visitors to leave their emails if they were interested. We got 11 conversions out of 147 visitors. Although that is not statistically significant, it still shows that our visitors have a general interest in our business concept. This is one of the most challenging and fulfilling projects I have worked on. While we were exploring the passion project life cycle, we quickly noticed that crowdfunding is a very crowded space to compete, and it is also difficult to design a user experience that will let campaign tasks be broken down into appropriate chunks. The whole team successfully made a good pivot mid-semester and earned 2nd prize in the final contest!